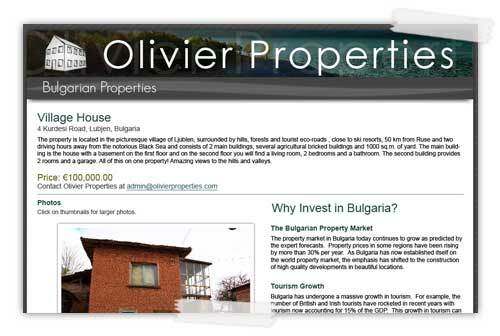 Olivier Properties is a growing company. Although a great deal of the company's business activities occur in Europe and the United States, Olivier Properties considers itself an international brand. While designing the listing page for the real estate company, it was important to create an immediate sense of strength, unity, and sophistication. The page full utilizes CSS styles to keep text uniformly formatted. Heading colors compliment one another as well as the header. A charcoal sub-heading announcing "Bulgarian Properties" is given a touch of depth through the addition of a flowing ribbon-like dash. Elegant textual effects like well-spaced headings, sub-headings, and copy, create a high-quality look. Sub-headings provide extra information not necessarily appropriate in the title in a non obtrusive way by using lighter text as well as a light color. Copyright © Olivier Designs 2008. All Rights Reserved.